It’s great to see you all on Shelfari. I really love connecting with readers and writers further. This is why I want to take some time to thank one of my followers, Indiscriminate Critic, for finding my Goodreads page. Now, you can join me on that site as well by clicking here. I really like Goodreads, because you can connect, but I LOVE the neverending trivia quiz about the books you’ve read. 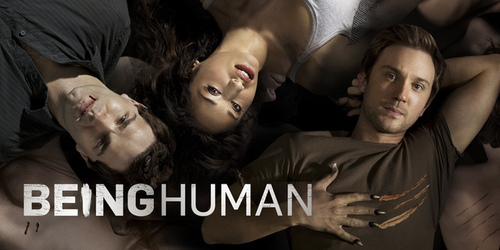 “Being Human” is about three twenty-somethings attempting to live together–except they’re supernatural. Aidan is a vampire, Josh is a werewolf, and Sally is a ghost. If you like supernatural, this series is for you. Even cooler, the Syfy channel posts all the old episodes, so you can catch up! Catch up on Season 2 here. It’s worth it. One of my best friends who lives far away watches it like I do, and we talk about it over the phone the next day. It’s a great show to try to predict and enjoy with friends. I love Being Human! I only recently discovered this (the Brit version, that is, I didn’t know there was a US version), and am catching up with all the back episodes on Lovefilm (which is a UK version of Netflix). It has added appeal for me as is filmed in my home town, so I’m constantly annoying my husband with cries of “oh, oh, I know where they are there! I recognise that building!” On Thursday we were back in my hometown going to a funeral, which isn’t such a good story, but I accidentally-on-purpose made husband take a wrong turning so we could drive past the pink house. Ahhhhh I’ve always wanted to watch this show! I’ve been meaning to watch it on Netflix, but I usually end up saying, “I’m just going to watch the show in my Instant Queue with the least number of episodes… Or I’ll watch a movie.” It seems like a really good show, and I watched one episode once and I liked it. Honestly, I liked both, but my friend liked the American, so I ended up watching that one. They’re very similar, but I think I like the American “Aidan” more, and the British “Sally” more. Cool, I can get this on Netflix. Another show that I’ve been obsessed about is Sherlock, which is based on the original Sherlock Holmes but set in modern times. Hey Shannon. Just wanted to thank you for the follow, and compliment you on your blog, it’s beautiful. Thought I’d pop this comment here as I’m a huge fan of the british version of ‘Being Human’ – watched seasons 2 and 3 in the run up to Christmas last year. I’m intrigued by the idea of an American version; sometimes these things translate poorly, but others have been brilliantly done, with the US version bringing something new/different to the concept. Which from the sounds of it is the case here? I’ll have to see if its available over here in the UK at all. It’s a fun show! I get a kick out of it, too. Didn’t know it was starting up again already…I’ll have to remember to tune in! I’ve only seen the british version of the show, and I lost track of it! I should start watching again. I think it gets A LOT better on his part. But I can also see what you’re coming from. I remember thinking I liked the British version more after the first episode, because I tried to convince my friend to switch, but she won, so I stuck with the American, and I ended up liking the American better in the end. I started this blog in late September/early October. I’d really love to be a part of community where I can get responses from other knowledgeable people that share the same interest. If you have any suggestions, please let me know. Thanks! Like “Being Human” ? I’m sure they have fan sites for it, but I’m not familiar with those.